Mehan began by laying out two contrasting principles, the universal destination of goods on the one hand and the right to private property on the other. The common good of society requires respect for both of these principles. He posed the questions: “Can we, should we recognize property rights in it or to it [the environment]? And what benefit can be derived from doing so, not just of the individual who holds the right, but for the environment, the ecosystem, or the commons?” He pointed out that the theoretical or philosophical challenges of harmonizing the universal destination of all goods with private property have preoccupied philosophers for millennia. Nonetheless, “The environmental or ecological issues [that we now face] represent a more perplexing problem because of the genuine challenges of protecting, while benefiting from, the earth’s resources and beauty. The project of designing or defining a property rights regime, relative to the commons, is of recent vintage.” Mehan quoted scholars Henry N. Butler and Christopher R. Drahozal on this issue: “Because of the common ownership of these resources [e.g. water and air], no one has adequate legal rights to protect against them.” He pointed out that without well-defined property rights, regulation, or some communal management arrangement, each person has an incentive to exploit the resource he or she has access to. Furthermore, without a property interest, a person “has no incentive to improve the economic productivity of a piece of land if they do not own it, by the same token, a natural resource is unlikely to be cared for if there is no property interest.” In other words, people tend not to care for things that they do not own. Mehan described several situations in which unclear or defective property titles have impeded private economic growth as well as development of sustainable resources such as forests and fisheries. Initiatives such as the land trust movement in the United States, which gave rise to nongovernmental institutions such as The Nature Conservancy, aim to actively protect the environment and natural resources. This type of movement relies on free market transactions between consenting parties. The Nature Conservancy acquires land by buying it and also works with local communities to protect biodiversity, water quality, and wildlife in partnership with private and public entities. Mehan pointed out that no matter how carefully we craft the new approaches, we must accept that we do not know what works all the time, every time. It is necessary to balance freedom, cost-effectiveness, and environmental protection, and we can never guarantee that property owners will behave in the way we might deem optimal. Conservation or ecological values are not inherent in the functioning of the market, hence a person has to bring those values to the marketplace, having learned them from some other source. Strong ethical supports are needed to preserve both market and competition from degeneration. This is especially important as it affects common pool resources such as rain, water, and fisheries. Mehan concluded “Without something like a conservation or land ethic, a sacramental regard for creation, a concern for future generations beyond one’s short life span on this planet, or some other moral and ethical North Star to guide and motivate citizens, farmers, ranchers, woodlot owners, and other actors, I am not optimistic that we can succeed on the basis of free-market principles only. There will always be a real need for reasonable regulations.” Purely economic drivers have their limits, hence family tradition, culture, and other motives can play an important part in how landowners make decisions about the use of their land and other resources. To view a summary video of our 2016 Fashion Intelligence Symposium, click here. “Be true to yourself” was the overarching message of Murray Hill Institute’s second Fashion Intelligence Symposium. With “Authentic Fashion” as it theme, the symposium brought together designers, fashion journalists, bloggers, and consumers to explore the many facets of the world of fashion. We were pleased to partner once again with the Fashion Institute of Technology and Villanueva Centro Universitario in Madrid in bringing this project to realization. The symposium was held on April 9, 2016, in the Katie Murphy Amphitheater at FIT in New York City. Joan Volpe, Managing Coordinator of The Center for Professional Studies at the Fashion Institute of Technology, welcomed everyone to the symposium. She invited everyone to view the exhibits at the Museum at FIT, Denim: Fashion’s Frontier and Fairy Tale Fashion. Four speakers shared their unique perspectives gleaned from their lives and careers in the fashion industry. Patricia Herrera Lansing, special projects director of Carolina Herrera New York and CH Carolina Herrera, shared her career path from fashion editor at Vanity Fair to her current position.Asked about what it was like to work for her own mother, she assured us that it was great fun and that they shared a lot of laughs together. Victoria Sanchez-Lincoln, the Fashion Director of the magazine Real Simple, spoke about “Communicating Authentic Fashion: How media provides strategies that enable consumers to remain stylish, modern and unique.” She described the decision-making processes that go into creating the fashion spreads for the magazine each month, and how theme, season, and current trends interact to keep readers engaged. A networking reception between the second and third talks gave the attendees an opportunity to meet the speakers and to share ideas and experiences with each other. “Authentic Fashion: creative, forward-thinking and designed with a woman’s desire for self-expression in mind” was the focus of Leonor Silva’s presentation. Leonor took us behind the scenes at her Brooklyn-based company Leonor Silva and gave us a step-by-step tour of the work that goes into designing, marketing, and manufacturing clothes. Her slides from her current collection had us all ooh-ing and aah-ing. Denyse del Carmen Floreano closed the afternoon by speaking about “Being Authentic in a Virtual World: How to find your styles and dress with authenticity in a world burgeoning with images and expectations.” As a former Miss Venezuela and a career model, Denyse experienced first-hand the expectations of body image that go with being front-and-center in the beauty industries. 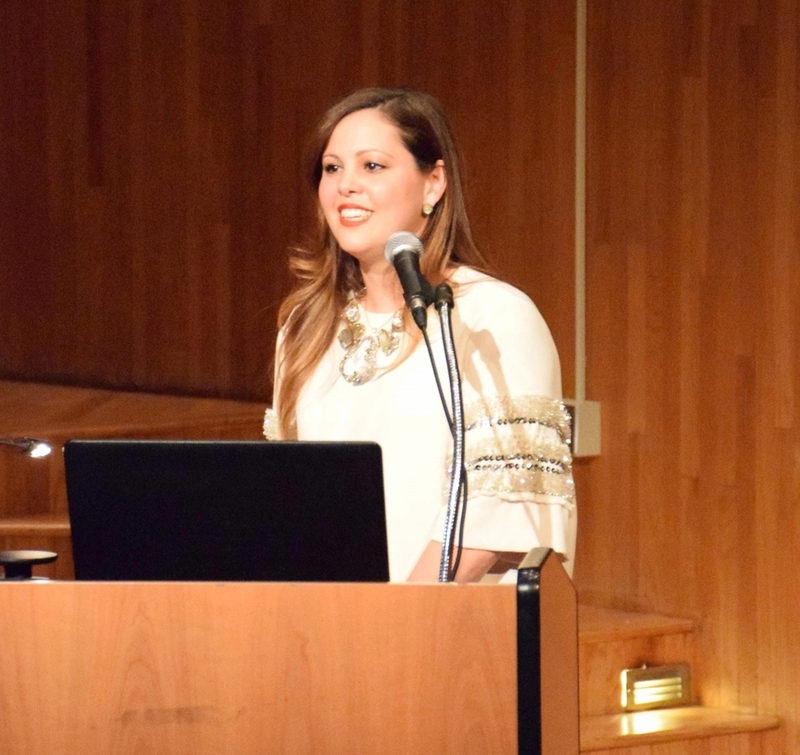 Teresa Carale, President of Murray Hill Institute, thanked the speakers and invited everyone to next year’s Fashion Intelligence Symposium, to be held on Saturday, April 29,2017. We will be posting more information on our website as plans progress.